Lasswade Primary School are doing some interesting work across the school with Critical Literacy as a result of a one day training day for Midlothian staff (Primary and Secondary school teachers and librarians – not sure if any librarians actually attended) as part of their CPD. The training Critical Literacy – Raising achievement through a Curriclum for Excellence was organised and run in partnership with the University of Edinburgh with a focus on “raising achievement across the curriculum through an action research approach to critical literacy ..”. “the way that we interact with and make meaning from different texts” and “involves the reader analysing and engaging with a text”. Text being defined as anything which communicates meaning. For early years this includes looking at pictures for clues and forming opinions of characters in stories. Critical questions to ask of texts include: construction of characters; gaps and silences; power and interest; whose view: whose reality? ; and questioning the composer. P5 – Scotland Today; identifying and explaining difference between fact and opinion (Loch Ness Monster) ; looking closely at text to see how the author influences the reader to take their point of view about the character (Granny Porage & Greyfriars Bobby); to predict what might have happened if circumstances had been different in the story – different ending, implications of different ending(Greyfriars Bobby). used critical thinking – very quickly began to question. Goldilocks went into a house that she didn’t know – would you? She sat in chairs which broke etc. It’s interesting to hear how this same story has been looked at from a critical literacy point of view / questions here compared to Kilmacolm Nursery Blooming Blooms questions. Both trying to encourage children’s critical thinking and questioning. It was also interesting to hear about critical literacy and see its important relationship to information literacy. It was also interesting to hear about the work of the Support for Learning Teacher and to hear of how children start in Primary 1 learning sounds and key words. They require support from the Support Learning teacher if the know less than 10 words. In Primary 2 the Support for Learning Teacher sessions are about spelling and phonics – checking letters. use bullet points and put information into their own words. My thanks to Lasswade Primary School, the Head Teacher, Louise Donaldson and her colleagues Hazel Stewart (Support for Learning Teacher), Audrey McGlade and her P5 class for allowing me into their world and sharing what they are doing with me. 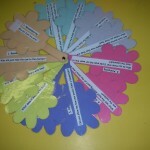 In 2009 Katrina Little, the nursery teacher at Kilmacolm Nursery (which is part of Kilmacolm Primary School) using Bloom’s Taxonomy worked with parents to form Blooming Bloom Questions for familiar fairytales so that the children are introduced to the benefits of questioning (Innovative approaches). See Blooming Blooms example questions for Goldilocks and The Three Bears. The questions are colour coded to represent the different parts of Bloom’s Taxonomy and attached to the responding coloured flower and put into a pot which is inside the front of each book (see above picture). The questions are there to reinforce that the activitiy is not just about reading the book but about gaining knowledge and understanding, applying, analysing and evaluating what has been heard and then creating new thoughts. It is also about fully involving the parents in their children’s learning. A visit to the nursery on Wednesday (17th February 2010) saw Katrina and the children in action. 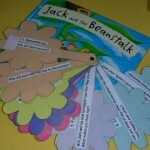 The story was Jack and the Beanstalk and I joined the children (a preschool group of 4 years old) as Katrina started to question them using the Blooming Blooms questions (copy of original Jack and the Beanstalk Questions). The children seemed to enjoy answering the questions and often you could see the thought process going on. In the applying section different children showed how they would climb the beanstalk. One boy talked about using an ice axe to help him climb which would indicate that somebody he knew used an ice axe to climb. Unfortunately Katrina didn’t get through all of the questions as a group of younger children had finished their activity and had returned to the nursery. This disrupted the older childrens concentration a bit. The books also go home with the children on a Friday so that the parents can be involved in the learning activity. 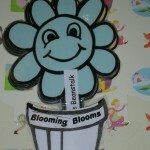 Reports indicate that parents are enjoying using the Blooming Bloom questions and children enjoy them too. This has lead to plans which are under way to introduce Blooming Blooms in Primary 1 linking it to their reading bookings and the Oxford Reading Tree. Those parents that were involved in the nursery project are said to be keen to be involved in the extension to Primary 1. My thanks to Mrs Katrina Little, colleagues in the nursery and children at Kilmacolm Nursery and the headteacher for allowing me into their world. By investigating the range of foods available I can discuss how they contribute to a healthy diet. Research activity – ‘Facts about our topic’ – working in pairs the children research a topic (fruit, vegetables, bread, dairy products) finding interesting facts about their topic using a selection of books from the school library that the teacher had picked and displayed in her classroom. when they visited so chapatis for this child is associated with Dundee rather than Indian cuisine). As a result of our discussions the girls were able to identify key fats about their topic. Another pair working on fruit successfully selected their facts without writing / copying whole texts. 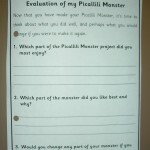 Evaluation Exercise– working in pairs the children had to discuss with their partners and use the evaluation form (see attached photo) to carry out an ‘Evaluation of my Picallili Monster’. if she could change her monster would she and why. The other child was indecisive and even with some questioning from me seemed to choose something randomly resulting in the part she liked best being the part she would change. As indicated the above exercises worked best when there was an interaction between the children and the teacher or myself with these activities to direct / encourage their thinking. Active learning is a wonderful thing to see in action but a single teacher on her own is not able to interact all the time with all the individual pupils or pairs. It did however make me think that assistance from other practitioners such as school librarians with such learning activities would be greatly appreciated and beneficial. My thanks to Miss Elizabeth Wood and her class at St Margaret’s School in Edinburgh for allowing me into their world. The children aged 5 years old listened to a chapter (chapter 4 I think) from a book about an owl finding out about night and darkness. They had to listened for a specific piece of information which they then had to remember. Questions were asked to ensure that they had heard and remembered it. Later on in the day they were each given a worksheet and had to draw a picture to represent what the chapter was all about. The teacher then went round each of them and asked them to complete a sentence with information they had heard. Some repeated the information exactly others put it into their own words. Whatever the child said the teacher transcribed it onto their worksheet. selecting books in groups to find information about a particular night animal that the group had chosen i.e. a fox, badger, bat. With the help of the teacher reading the text the children decided on the 4 most important facts about the animal. Later each group told the rest of the class what they had found. art of the week where they had to look at a picture of a piece of art Rodin’s Thinker and say what they thought it was about. It was amazing to see then looking at it, thinking about it and then giving their thoughts. I could go on but will end there. My thanks to Mrs Lisa Bonar and her class at St Margaret’s School in Edinburgh for allowing me into their world. Discussions regrading the sort of things that would be useful to teachers regarding their own information literacy was also covered. It has certainly helped my thinking for the work ahead of me and I look forward to using this knowledge along with other experiences of Primary 2 and 3 to come in the new year. A video featuring GCU’s Department of Fashion, Marketing and Retailing Fashion Brand Retailing course for S6 pupils, is now live on the Learning and Teaching Scotland website. The video, was produced as part of Her Majesty’s Inspectorate of Education’s Journey to Excellence project. HMIe singled out the department’s work as an example of how universities should interact with other agencies and the community and for developing a culture of ambition and achievement in its students. The video features the department’s work with school pupils, with pupil and staff interviews. It also includes input from the university’s Effective Learning Services on aspects of information literacy for the course research assignment, referencing, critical thinking / Literacy and Study Skills (Academic Literacies). Other support offered by Effective Learning Services are ‘ Vidcasts for the self directed learner’ by Angela Shapiro, Lecturer & Aidan Johnston, Learning Technologist, Academic Support and Employability, PASS). A Vidcast or vodcast, contains audio and images, either moving or fixed. The impetus was research on students’ attitudes towards workshops by the ELS. The majority of responses rated the workshops high/very relevant. Nevertheless, it is impractical to expect that every student can attend the workshops or meet with ELS staff face to face and many students access the ELS materials on line (4,595 used support guides on line 2008/2009). Moreover, many students commented that they wanted to access workshop material at a later date. Podcasting appeals to auditory learners and with the addition of visual prompts the vidcast can also support dyslexic students in retaining information. Alternatively, users with visual impairments will be able to select to listen solely to the audio element and can download the material on to their mobile device. Students can also choose when and where they wish to engage with the vidcasts and this approach enables students to revisit the material at their own pace, all contributing to self – directed learning opportunities. The PowerPoint slides are in chapters, supported by further links to specific areas of the ELS website to give additional information. Two formats were used: one for on line access embedded within a webpage using a flash based video player and one for students to download for use with their iPod/mobile video device. The Scottish Library and Information Council (SLIC) launched on 3 December 2009 a new service development and self-evaluation framework for library and information services in Scottish Further Education (FE) colleges, to replace the previously published toolkit Resources and Services to Support Learners. Thanks are also due to Christine Irving and John Crawford of Glasgow Caledonian University’s Scottish Information Literacy Framework project who ably demonstrated to the Working Party the importance of information literacy as a core competence enabling independent learning in a vocational context. SLIC recognises that college library and information services are key strategic business assets, whose staff have a major contribution to make in supporting flexible, responsive, high quality learning and teaching programmes and in promoting learner engagement. Together with changes to the strategic and policy context of further education Scotland has recently introduced the biggest education reform for a generation. The Curriculum for Excellence brings the key role of the library into sharp focus in supporting the development of successful learners and confident individuals. The library provides staff and students with the opportunity to exercise their entitlement to access information and develop comprehensive literacies in a supportive environment. Access to structured information skills programmes to develop critical thinking skills. As a core curriculum support service, the quality of the library service reflects the professionalism of the institution as a whole. Hopefully library services and staff can use the above to support / demonstrated the work they do and their relevance to the college as a whole. In what ways do service staff work closely with curricular staff to embed and support the delivery of information literacy and research skills? At a recent event at the Mitchel Library, Glasgow I was asked about examples of public libraries offering information literacy courses. Although there is some activity in this area we tend not to hear about it so whilst the following is not taking place in Scotland but Wales (one of our Celtic cousins) I thought it was worth a mention. establish a consistent approach across all libraries – public branch libraries, primary school libraries and secondary school libraries. can provide materials, training etc for primary and secondary schools and then it is up to individual schools. In secondaries there are professional librarians who are already doing a lot of good work, as you know, who will be very happy to have a clear set of activities, curriculum links etc. We will be working together organising / providing materials, activities, suggestions. As Field Officer, I will be co-ordinating the secondary part. We are intending to include our links to QMU in this section. We are using existing provision as the starting point for primary aged children too. The Young People’ s Services section of the library service is responsible for providing services to primary schools. They provide term loans of topic boxes to support investigations / projects and fiction boxes to each primary. They also help schools to maintain appropriate stock in their own school libraries and provide advice and professional support when requested. Agnes has also already met our NQTs this year. She and Susan Boylan, the Librarian Young People’s Services, gave a presentation to new teachers. Additionally, all branch libraries in East Lothian actively encourage classes from local primaries to take part in class visits on a regular basis. Activities during these visits are designed to develop information literacy skills as well as encourage children to visit their local libraries in their leisure time. We have already mapped these activites against CfE outcomes and experiences. The Education Secretary Fiona Hyslop announced the publication of the strategic vision and key principles for assessment in Curriculum for Excellence at the Scottish Learning Festival on 23 September 2009.